The Cayman Islands Marriage Law (1963) which governs all marriages in the Cayman Islands sets down two distinct procedures for residents and visitors. 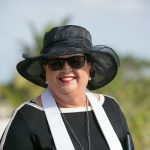 I have written elsewhere about the procedures for visitors, today I am writing about the procedures for residents (if you are here on a work permit or as a permanent resident) and Caymanians. If you have been living here for more than 15 days you are classified as a resident, and you must be married by Banns. 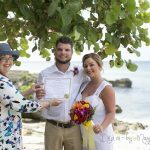 When you decide you wish to be married in the Cayman Islands you will need to complete a Notice of Marriage and take this to a Civil Registrar of Marriages or a pastor (marriage officer). This form can be obtained from your Civil Registrar. 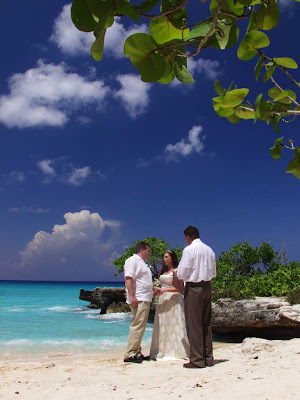 Email me at mywedding@candw.ky I will send you the Notice of Marriage, and a document called "Information on Getting Married in the Cayman Islands"
Under new procedures, the Civil Registrar or pastor will ask you a number of questions in other to eliminate any suspicion that you are contemplating a marriage of convenience, which is illegal. To further guard against this, your Notice of Marriage signed by you must be witnessed by a resident of your district who has known each of you for 2 years. (These do not HAVE to be the same two people who will witness your marriage. Your Civil Registrar or pastor will ask you for a photo-copy of your passport. If you are not Caymanian then you must show proof that you are legally resident. You may be asked to provide a copy of your birth certificate. If your permission to remain in the Cayman Islands has expired you may not be married unless you can obtain a reasonable extension. If you have been married before, you must provide the original Divorce Decree or spouse's death certificate or a certified copy, in English and the translation must be notarised. 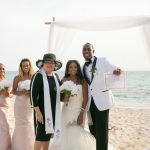 If one party to the marriage is off island immediately before the marriage, the law allows the Banns of Marriage to be published at your Civil Registrar or pastor's discretion. The documentation and questioning referred to above must still be completed prior to the wedding date. Residents MAY NOT be married by Special Marriage License, this is for visitors. If you live here there is no way around being married by Banns if you want to be married on island. Basically this is an announcement of your upcoming marriage which must be published as a Public Notice for 7 clear days in order to give any objectors an opportunity to have their say. Any objections must be in writing and the objector must appear before the Civil Registrar or pastor to defend his/her objection. A Civil Registrar must sign and publish these Banns outside their business office. All Banns for Cayman Weddings/Simply Weddings are published on a Notice Board near to the West Bay Pharmacy, on the ground floor of Centennial Towers in West Bay. The Banns will state your full name as given in your passport. They will state your CONDITION - this is, never married, or divorced, or widowed. They will state your CALLING - this means your occupation, what kind of work you do. They will state your AGE at your last birthday. They will state your length of time residing in the Cayman Islands. They will state your ADDRESS this means your residential address not your Post Office Box number. Lastly it will state your father's name. If your father is deceased, this is indicated as (dec.) If your father is unknown, your mother's name can be used indicated as (mother). Some people wish to have their Banns as a souvenir, if you do, let me know and I will give them to you once the 7 days have expired and there have been no objections to your marriage. Banns of Marriage are valid for 3 months from the day of publication. At the ceremony your Civil Registrar will give you a signed copy of your Marriage Certificate. This is the gold-coloured certificate you see couples holding on this site. As soon as possible after the wedding, your Civil Registrar will file your marriage with the General Registrar of Marriages in the Citrus Grove building on Goring Avenue. Once your marriage has been registered you should make arrangements to get your Registered Marriage Certificate from this office. The registered Marriage Certificate will say "secure copy" on the back. On the front it will give the details of your marriage, and it will have a watermark of the Cayman Islands crest and the Registrar General's seal. This is the legal document you will need to show your change of status to "married". 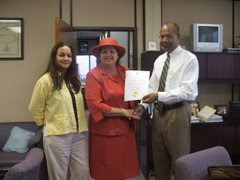 This is a picture of me being presented with my letter of appointment as a Civil Registrar of Marriages for the Cayman Islands. Most residents choose to be married on a Saturday afternoon, so reserve your date early to avoid disappointment. I do a limited number of Sunday weddings which attracts an additional charge. Your wedding is a very special occasion and I want to help you make it a day to remember. 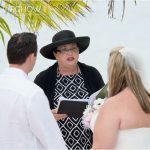 I have been officiating at weddings in Cayman for 14 years. Please call (345) 5256551 or email (mywedding@candw.ky) me if you have any questions.